As the Voice of Business, your chamber works to keep you informed on issues that could affect your business. Whether it’s a new way to protect your bottom line, best practice sharing, or staying ahead of legislative changes, we strive to help you stay informed so you can focus on what’s important: Your business. With the strength of 2,400 members behind us, your chamber can also provide a unified voice for the Dayton region’s business community. When we speak for you, decision makers listen. Stay informed on the latest business trends, cost saving tips, information on business policy and more. Read press releases produced by the Dayton Area Chamber of Commerce over the last 12 months. Read archived issues of B2B, a monthly op-ed written by chamber president & CEO Phil Parker for the Dayton Daily News. Watch the latest videos produced by the chamber, including Business Connections, our monthly TV show. 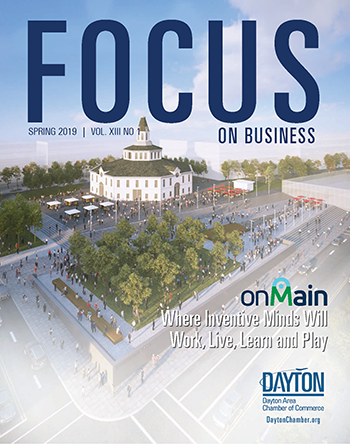 In the Spring 2019 issue of FOCUS on business find out how Opportunity Zones are impacting economic development in the Dayton region.